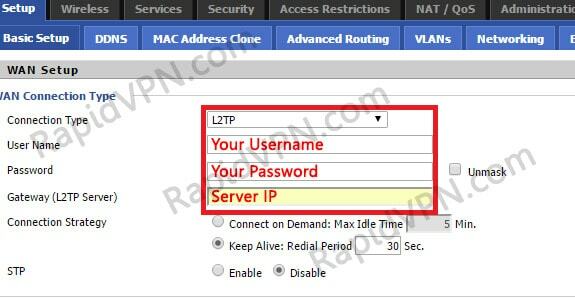 How to setup L2TP VPN connection on DD-WRT Router? 1) Open a web browser and type an address "192.168.1.1" (by default for DD-WRT router). Here we have changed it to "192.168.2.1" because ADSL/Broadband main/first router is using "192.168.1.1" address. Both routers must be in different subnets. 2) Go to "Setup" section and click on "Basic Setup".